Stud Receivers | Ball Studs, Pushnut Fasteners, Speed Clips - Bolt Products Inc.
Stud receivers are used for quickly and easily attaching materials using standard ball studs and other fasteners. They are commonly used for attachment to tubing, nails, rivets, die cast studs, and rods. Stud receivers bite securely to smooth or hard, metal, plastic and wood surfaces, making stud receivers ideal for nearly any line manufacturing application. Versatility- Stud receivers can be made permanent or removable by using different fastener or stud modifications. 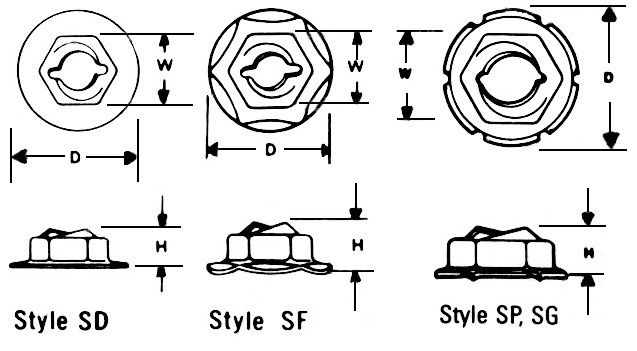 Reduction of parts handling, such as special nuts, threaded collars and washers. Design variations of our stud receivers are numerous. Stud receivers they can be ordered to fit over a wide range of ball stud sizes and shapes.